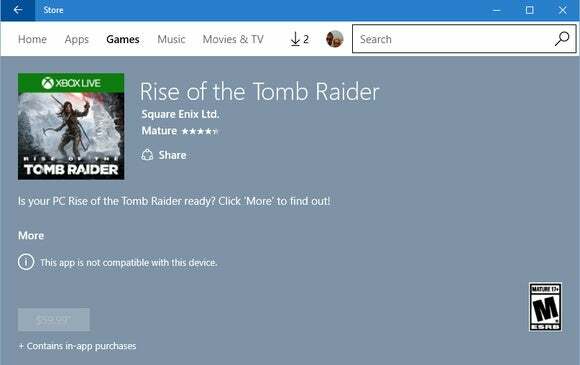 Microsoft is bringing AAA PC games like Rise of the Tomb Raider to the Windows Store in Windows 10, but buying them is a bad idea. It’s no secret that Microsoft wants to compete with the likes of Steam and GOG by providing a one-stop shop for AAA PC game titles such as Rise of the Tomb Raider and the upcoming Quantum Break. Be warned, however: Games purchased from the Windows Store are Universal Windows apps, which are severely sandboxed and can’t touch other apps or programs. Universal Windows apps are a great way to get mobile games like Candy Crush, Lara Croft Go, and Minecraft: Pocket Edition onto your PC. But AAA titles requiring a dedicated graphics card are different beasts, and games purchased via Windows 10’s Windows Store today are plagued by a host of restrictions that aren’t present on other PC gaming platforms that sell games as traditional PC programs, as How-to Geek and Reddit users first reported. The impact on you at home: PC gamers may not want to go with the Windows Store when so many other alternatives exist with far better support for all the features PC gamers love. Xbox fans, however, can take advantage of a new cross-buy feature that will debut with Quantum Break. Pre-order the upcoming game on Xbox and you can play it later on Windows 10 with game saves syncing between the two machines so you don’t lose your progress. It’s an innovative approach for Xbox gamers who also own a respectable PC rig. For starters, Windows Store games don’t work with frame rate counters. It doesn’t matter whether you’re talking about a solution supplied by your graphics card such as Nvidia’s ShadowPlay or third-party programs like Fraps. You simply can’t use them. That’s a problem since being blind when it comes to frame rates can make it difficult to adjust necessary graphics settings to squeeze the best performance possible out of a game. Nope, won't work with Windows Store games. High-level gamers with machines rocking dual graphics cards won’t be able to take advantage of their hardware with Windows Store games, since Nvidia’s SLI and AMD’s CrossFire multi-GPU technology aren’t supported. That should all be enough to ward off many gamers, but we’re not done yet. Windows Store games lack an EXE file so there’s no way to add these games to Steam and manage them there. That means you can’t use the Steam overlay while in a Windows Store game, so you can’t access handy Steam features like screenshots or chatting with friends. Additionally, Windows Store games lack support for mouse macros for complex maneuvers, or any kind of modding. Plus, borderless fullscreen mode is always on. It’s pretty clear the Windows Store is less than ideal for most PC gamers at this point. All of this may change over time if Microsoft truly wants to get serious about supporting gaming—although it’s not clear how many of these difficulties are permanently limited by the Universal Windows app platform itself. Will DirectX 12’s Explicit Multi-GPU feature work with Windows Store games, for example? For now, however, if you love using any of the features mentioned above stay away from the Windows Store and stick with GOG, Origin, uPlay, and Steam.